The Bemidji State men’s hockey team split a series with Minnesota State last weekend at the Sanford Center. BSU senior goaltender Dan Bakala turned in a phenomenal effort on Friday night in the 2-1 win. The Mavericks got on the scoreboard first with a goal from Max Gaede with 11:02 in the first period, with assists by Michael Dorr and Zach Lehrke. Freshman forward Danny Mattson evened the score late in the second period with his second goal of the season, with an assist by Junior defenseman Jake Areshenko. The score remained tied at one heading into the third period, when Beaver junior forward Jordan George provided the heroics again. George was in the right place at the right time as he put a rebound past MSU goaltender Phil Cook. Junior forwards Ben Kinne and Aaron McLeod assisted on the goal. Cook finished the game with 24 saves. Bakala and the Beaver defense held off the Maverick offense for the win. Bakala stopped 39 shots on the night. The Mavericks got on the board first again on Saturday night when Eriah Hayes scored early in the second period. Junior forward David Boehm answered with a short-handed goal on a break-away. It was Boehm’s second goal of the year and the second short-handed goal of the year for the Beavers. 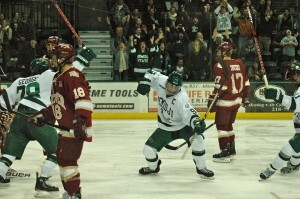 Although MSU did not capitalize on its power play, they did score within seconds after it ended. Dorr’s goal gave the Mavericks a 2-1 lead. Lehrke added a goal five minutes later to double the lead to two goals. BSU answered quickly with a goal from sophomore Radoslav Illo. Illo’s sixth goal of the season made the score 3-2 heading into the third period. Although the Beavers had plenty of good looks at the net in the third period, it was Dorr and the Mavericks who found the net in the third period.Dorr broke away and scored his second goal of the night with just over two minutes left to deflate the Beavers. MSU added an empty-net goal by Mike Louwerse with 1:09 remaining. Minnesota State (9-18-1; 5-14-1 WCHA) walked away with a 5-2 win. Cook made 29 saves on the night. His counterpart, freshman Andrew Walsh, stopped 20 shots for the Beavers. Bemidji State (12-12-2; 6-10-2 WCHA) will travel to Nebraska-Omaha for a road series this weekend before returning home for a series with Colorado College.